First go to the location of the document, copy its URL, then go back to where they wanted to create the link, then paste the URL into the text box. In this post I will provide a walkthough of a relatively simple solution you can implement to provide a Browse button on the form that creates the Link to a Document. The input form that you see when creating a new Link to a Document is actually the document template for that content type. Check the settings of the Link to a Document content type in SharePoint and you will see that it is set to /_layouts/NewLink.aspx. We will create a clone of this page, NewLink.aspx, and add our browse icon to it. We will then configure the Link to a Document content type to use our new page as its document template. We will now configure the Link to a Document content type to use our custom template and test that things are still hanging together. Go ahead and deploy the solution. 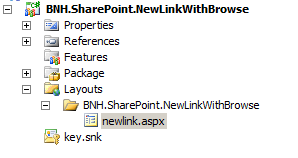 Then, go to your SharePoint site > Site Settings > Site Content Types > Link to a Document > Advanced settings > and change the Document Template to be /_layouts/BNH.SharePoint.NewLinkWithBrowse/NewLink.aspx. Test to ensure that you can still create new Link to a Document items. Back in Visual Studio edit the Newlink.aspx page. Add the following tag registration to the page. This will allow us to reference the AssetUrlSelector control. AssetUrlTextBoxVisible=”false” – The control by default has its own text box to display the URL of the selected document. We do not need this as we will be using the text boxes of the Link to a Document form. We have set the control to render an image rather than a button. We will later add the image file to our solution. /*If newAssetUrl is an internal SP URL, it will not contain the server path (i.e. for it to pass validation. If the newAssetUrl is an external URL, it will have the full absolute path and we won't have to touch it. //construct the path from various parts of the current location. The only slightly tricky bit here is that the OOTB form requires the value in the URL text box to start with http:// or https://. The URL returned by the AssetUrlSelector however is server relative (i.e. do not have the http://hostName part). We therefore will need to append the http://hostName part to the URL value for it to pass validation. The other thing is that the user could type an external URL into the AssetUrlSelector (e.g. http://www.google.com), in which case an absolute URL will be returned to our script and we won’t have to do anything. Next, we will add an image to our solution that will be used as the browse icon. In Visual Studio right click on the sub-folder underneath the Layouts mapped folder and add an image of your choice (e.g. http://www.iconspedia.com/dload.php?up_id=94032). Remember to update the PickerButtonImage attribute of the AssetUrlSelector control in the markup of the Newlink.aspx file to match the image of your choice. The above CSS will resize the image of the browse icon. Depending on the image you have chosen to use, this CSS may not be necessary. The width of the URL (ID=”UrlInput”) and Name (ID=”NameInput”) text boxes on the page is set to 300. I have found that the browse icon wraps to the next line on some browsers with this setting. Change this to 260 to ensure that it does not wrap. Go ahead and deploy your solution. You can download the complete Visual Studio solution here: BNH.SharePoint.NewLinkWithBrowse.zip. Want to improve the user experience in SharePoint? Check out my other custom solutions here. 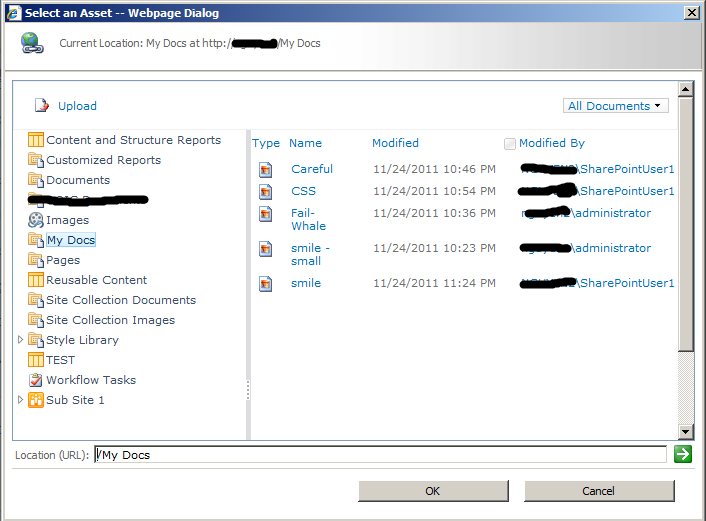 I’m new to sharepoint development and need to be able to link to file in a fileshare location. How can I modify this to enable to user to browse network share and create a link to a file. Sukh were you ever able to accomplish this? i am looking to achieve the exact same thing….Please let me know! What’s really frustrating is that such an elementary feature isn’t OOTB. Does Microsoft really think it’s OK for users to cut & paste a URL to link to a document? Great post , It is very well defined. Many thanks. Just get one error with the hardcoded ids “ctl00_PlaceHolderMain_ctl01_ctl01_UrlInput” and “ctl00_PlaceHolderMain_ctl01_ctl01_NameInput”. I just replaced it with “” and “”. Then everything is working fine. Hmmm strange.. didn’t spot that during my testing. Thanks for posting back the fix :).